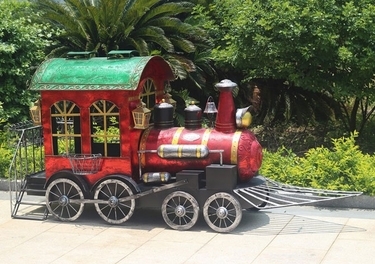 At nearly 7 feet long, this amazing Metal Christmas Train in Christmas colors will inspire youthful awe and amazement to all your visitors. For train-loving boys and girls of all ages, this absolutely beautiful piece is great for both indoor and outdoor use, and makes a stunning functional plant stand as well with its many included removable baskets! Complete with boiler and chimney stakes, smoke box domes, cab and wheels, and a fantastic decorative cowcatcher and headlamp in front, this amazing piece of Train Decor will certainly impress all!